VoIP phone benefits – why get VoIP? VoIP stands for Voice over Internet Protocol, which basically means that you can make phone calls over the web, instead of via a traditional phone line. There are plenty of advantages to working this way, but the key one for most business users is the cost, which can be much cheaper than using a standard telephone system. When you use a VoIP phone system, your voice is digitized into packets of information that the internet can route to the recipient. Your recipient could be another VoIP user or a traditional phone user, in which case your VoIP service providers’ interface will route the call via the public telephone network. This allows VoIP users to contact standard and mobile telephone users seamlessly. The diagram below shows how VoIP works, and the ways in which it can communicate with your office infrastructure. There are many different methods used to achieve this, however. For example, the system might use a ‘codec’ – a way of encoding audio or video signals – which is optimized for narrow bandwidths, for higher security, or for near-flawless audio clarity. Some systems can even choose which codec to use based on network performance and other factors. Some ‘first generation’ VoIP solutions are modeled after the older phone network in order to offer fully compatible services. Other, ‘second generation’ VoIP providers like Skype provide free or nearly free traffic over a closed network of registered users. Still other, ‘third generation’ providers use a ‘federated VoIP’ system to allow dynamic connectivity between internet domains. In terms of style and design a VoIP phone is made up up many of the same components as a typical desk phone. Advanced functions which will be explored in more detail below may include large touch screens and additional Ethernet ports. Once you have all of the necessary components in place to build your VoIP system, it is worth looking at the different types of phones available for businesses. There are four main types of VoIP phone; desk, wireless, soft and conferencing. VoIP Desk Phones– The “regular” VoIP phone looks like a traditional landline handset but uses an internet connection to send and receive audio and other information. Compared to traditional desk phone handsets, VoIP phones can have greatly improved features, such as automatic call forwarding to mobile, and voice-to-email transcription. Wireless – A VoIP phone with built in Wi-Fi or a DECT transceiver which connects to a base station or access point. Cordless phones allows users to move freely around their workspace while on a call. Softphones – A software application which is installed onto a computer and equips the device with the ability to make and receive calls, and “become a phone” like any other handset. Softphones are particularly useful for remote workers and even call centers because they are relatively cheap to set up and run. With so many options available, VoIP offers a workable and practical solution for many businesses and contact centers who need a fast, reliable and high quality communications system. See how much your business could save on a VoIP phone system! Use our free price comparison tool now. VoIP phone benefits- why get VoIP? Getting a new or upgraded phone system for your business can be a costly investment. This is one of the main reasons VoIP phone systems are so attractive. VoIP phone systems allow you to save a great deal of expense by eliminating setup and installation fees as well as preventing the need for any on premise server equipment and maintenance. All you need is an internet connection and your existing hardware- such as your laptop or mobile -and you can get set up with all the top professional business phone features in minutes, with plans available for less than $20 per user per month. Gone are the days when VoIP technology could not match the voice clarity of traditional phone networks. Today you can make loud and clear phone calls anywhere in the world using a VoIP business phone system. With the exception of free services such as Skype, you can expect a reliable service all year round from your VoIP provider. The virtual nature of VoIP means you no longer have to deal with the hassle of registering and setting up country specific phone numbers. With VoIP, you can be reached on the same business number wherever you are. Your phone system is not reliant on any physical location. This is vitally important for any business owners who are required to travel for work, and may be worried about picking up calls on the move. It also means if you ever move office, you’re good to go right away. For an organization to grow, even the smallest teams must ensure output and productivity levels are high. A VoIP phone system can help promote your business productivity and ensure KPIs are hit by offering features such as call recording and analysis, unified video and voice functionality, and customizable touch-screen displays. 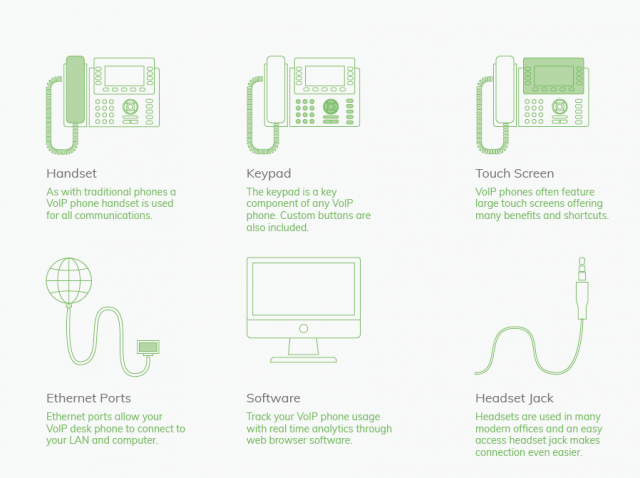 Learn more about VoIP phone features below. As well as the convenience and cost-saving benefits of converging your telephone and internet systems onto one network, VoIP also brings access to advanced phone features. The kind of phone service features that, until a few years ago, only large corporations could have afforded with a traditional telephone system. Business VoIP providers usually provide a great degree of customization too, allowing you to piece together just the features you want or need for your particular requirements – without having to pay for bundled features that you aren’t going to use. The difference between the old-school answering machine and VoIP-enhanced voicemail perfectly illustrates how VoIP systems take conventional concepts and bring a new level of flexibility and efficiency. With VoIP voicemail, you can get each voicemail emailed to you as an audio file attachment, or automatically transcribed and delivered to you via text message or email. You also have the option of tracking missed calls from your email, and calling them back directly from within your email interface: a feature known as ‘click to call’. You can even incorporate fax into the equation, sending and receiving ‘virtual faxes’ as PDFs. Employees set up as administrators can also manage billing and advanced customization of the phone system, as needed. With VoIP you can assign each employee, or team, a single ‘virtual extension’ number that covers multiple phones, rather than every device and location needing a separate number. Calls to virtual extension numbers can then be set up to ring all of a group of phones simultaneously, or in a certain order. Rules can also be made for how to handle a missed call: You can choose if a call should go to voicemail or be passed to another extension. The virtual extension also works on outgoing calls, so whichever phone device you’re actually calling from or where you are, the receiving caller ID will show the same number and you can present a consistent front to clients, suppliers and customers. Also sometimes called a digital or virtual receptionist, an auto-attendant is a voice menu system that greets and guides callers through numbered options so that they can be transferred to the relevant departments or extensions within the company. An IVR is similar to an auto-attendant feature, but more advanced. Like an auto-attendant, an IVR allows callers to press a button or speak, in order to direct their call to the department or recipient they are trying to reach. However, an IVR can also collect and provide detailed information. For example, an IVR could ask callers how satisfied they are with the customer service they received and record callers’ ratings input from 1 to 5. An IVR could also help a caller make a purchase by securely taking their credit card numbers, or pull up a customer record by having the caller input their date of birth. By contrast, an auto-attendant cannot integrate information in this way. An auto-attendant can only redirect callers using a limited menu of options. Automated IVR systems can handle high volumes of incoming calls, reduce costs and improve customer experiences by providing access to information and services 24 hours a day without the need for human staffing around the clock. Related to the “hunt group” or “line hunt” feature in traditional PBX telephony, ACD is popular with businesses receiving high volumes of incoming calls. The ACD system distributes incoming calls among a specific group of phone terminals or operators based on particular criteria such as the customer’s phone number, the selected incoming line to the system, or the time of day the call was processed. This VoIP feature allows a user to enter a call between two other extensions or between an internal extension and an outside line, either creating a three-way call or simply monitoring (listening in on) active calls. The feature can be optionally set up to sound a warning tone to the other users when a barge-in is about to take place. This feature allows customers to call your business directly from a form or contact page of your company website, making customer communications fast and easy. VoIP users have the option to record, playback, download and delete any incoming or outgoing calls. This feature is often implemented on an individual extension basis, so you make this a system-wide feature or you can choose which phones or extension users have access to the record functions. Day/Night mode allows VoIP users to set different rules for how their phone system functions or routes calls, depending on whether incoming calls are received during business hours (day) or after hours when no-one is around (night). Night mode typically serves as an ‘autopilot’ mode until the day mode is restored the following morning. This feature enables VoIP users to set up virtual meeting rooms, which can then be joined by participants on their own devices. Most service plans will allow access for 15-25 participants as standard. Going even further than conference calling, video conference calling works the same way, but also presents all parties with a picture (live video) of the other callers. This is often an add-on to a core VoIP service. VoIP costs can vary depending on the size of your business and the type of service you opt for. However, the entry level price for small businesses is far lower than traditional phone systems. This is especially true if you opt for a totally cloud-based system, with no need for dedicated onsite hardware, doing away with extra costs and maintenance charges. For these, you could be looking at less than $20 per employee a month, depending on the provider. Costs for a locally hosted traditional PBX system are considerably more. To find out how just how much it will cost your business, or how much you could save by switching to VoIP, compare free tailored price quotes from leading companies. VoIP vs landline: which is better? While a traditional landline may be seen as dependable and robust, it’s a hugely outdated technology, restricted by physical limitations and a lack of recent innovation. It can also be costly and inflexible for a business to deal with. VoIP systems on the other hand are highly versatile and comparatively inexpensive. If you run a modern business, you’ll want a modern telephone system, and that’s VoIP. View our VoIP vs Landline phones guide. What’s the difference between VoIP vs Cloud telephony vs Hosted PBX phones vs Hybrid PBX? Getting your head around VoIP based systems can be confusing, given the numerous terms that are used to refer to it. VoIP is the term given to making telephone calls over the internet instead of via a traditional phone system. The other terms listed above simply refer to the different ways this kind of internet telephony can be set up. Hosted, or Cloud Based PBX systems are virtual telephone systems that are hosted off site by a third party. Businesses pay a subscription, usually per employee, to use these systems. Companies that already have an onsite PBX, perhaps from an existing or previous traditional phone system, can opt for a hybrid solution. This means that elements of the cloud telephone system can be accessed via the company’s own PBX system, with some integration. On the other hand, while your office phones may be down, you’ll still be able to access your VoIP line via a mobile device such as a smartphone or laptop, and leading companies will set calls up to automatically reroute to such devices and numbers, in the case of an office connection drop. As a business owner, you’re constantly looking for ways to grow your business, and you don’t want to be hamstrung by your telephone system. This is one of the key selling points of VoIP, as it allows you to quickly and cheaply expand your phone system at the same rate as your company. Can I use my existing telephones with VoIP? This will depend on the telephone system you currently have, but if it’s not compatible, there are plenty of dedicated VoIP phones available. It’s also worth remembering that one of the positives of VoIP is that you don’t even need a traditional phone. You can use the system in conjunction with a cell phone, or even make calls through your computer. A VoIP phone system can help modernize the way your business communicates and will grow at the same rate as your company. VoIP will bring your business into the 21st century. If you’re still not convinced, compare prices today to see how much your business could save on a new or upgraded phone system. A clear business communication system is essential for success. But which is better for it: VoIP vs Landline? Analog vs Digital? New vs Old? Find out the differences to see which telephone system is right for your company, VoIP or landline, and how much you'll have to pay for it. If you're looking to make the leap to a VoIP telephone system for your business, we've done the hard work for you and broken down the costs you can expect to pay for a a VoIP system, whether it's hosted by a VoIP provider or locally. We also consider the additional costs. Google Voice is an internet based VoIP technology that offers a range of features many standard phone providers deliver. However, it also presents a number of issues for users; reliability is just one of them. If you're thinking of switching, here are some alternatives.